Internal fixation of fractured elbow. Labelled artwork and corresponding X-ray of internal fixation of extensive fractures of the distal (elbow) end of the humerus bone in a patient's left arm. This is an anterior (frontal) view of the elbow in its extended position, with the fractures being of the lateral and medial condyles (see C021/0784 for the pre-operative X-ray). 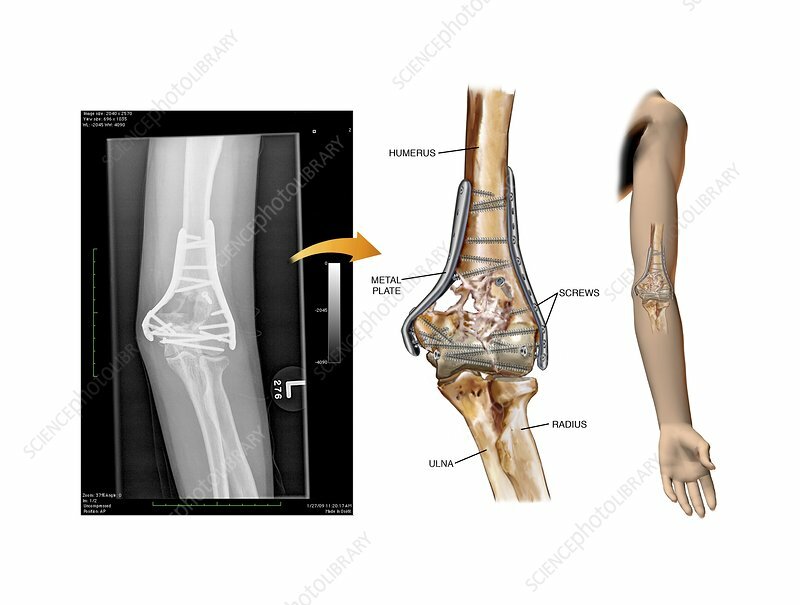 The artwork at right shows the location of the elbow bones in the arm, with the joint in extension. Screws and metal plates have been implanted across the fractures to hold the broken bones in place, allowing them to heal in the correct alignment.